Oh, tra la. My excitement knows no bounds. My beloved baby sister is here for her first visit in ten years or so, and better yet, she’s brought Charlotte with her. I’d not spent much time around Charlotte, especially not since my doctors got me off those meds that were screwing my brain up, so it’s not all that surprising that the more i see of her, the more i enjoy her. I remember her wonderful coup in 2000 when she managed to get my sister and me into the brand new Denver International Airport immediately after the opening ceremony when it was still fully illuminated but no human besides ourselves and a handful of maintenance and security folks remained inside. Picture having all that space to yourself and with a knowledgeable guide leading you to all the best vantages. When we’d had our fill and were driving home just after sunset, Charlotte stopped the car about a mile away from the terminal so that we could get out, look behind us, and see it rising from the prairie, brilliantly illuminated from within and without and glowing like not an emerald city, but rather one of diamond. Nothing so dramatic this time since i was the expedition leader, but I did get to take them up to meet Gloria in Santa Rosa, have a fine lunch at Rendez Vous Bistro (where the food is much better than their French), and drive them home down the coast. 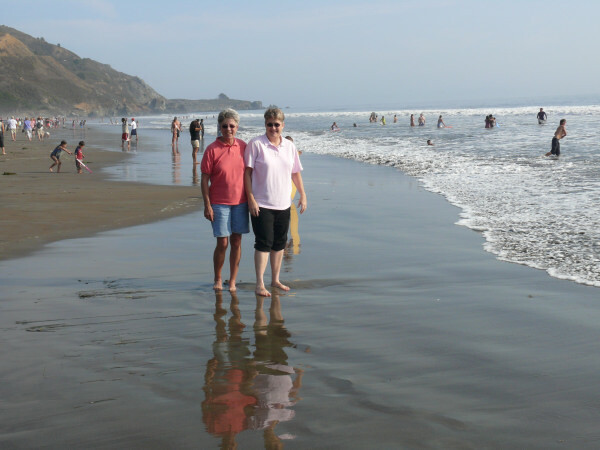 We spent an hour at Stinson Beach on a day when the air was so warm that the sand was packed with people and there were even a few folks in the icy water. Becky (on the left) is the light of my life. I adore her. We marvel at how lucky we are to be so devoted to each other when we see so many other people at war with their siblings. But it’s not surprising i love her since she’s so kind and thoughtful toward everyone. For example, she recently learned that a friend of hers in Denver wanted to make our mother’s famous pie, for which i had painstakingly described the preparation in my recipes (see The Pie). Anyone but my sister would have just sent her friend an email containing a link to my recipe. But no, Becky is so loving that she went to all the trouble to copy the entire recipe and then painstakingly edit out all the entertainment and background material before she passed it on, leaving only the minimal necessary information and sparing her friend the ordeal of slogging through the quagmire of my prose. How could anyone not love a sister so thoughtful? And yes, despite Becky’s background as a journalist, her own prose is not the “nasty, short, and brutish” stuff that Stella Gibbons accused journalists of writing in Cold Comfort Farm, but i have to admit it sure is to the point.